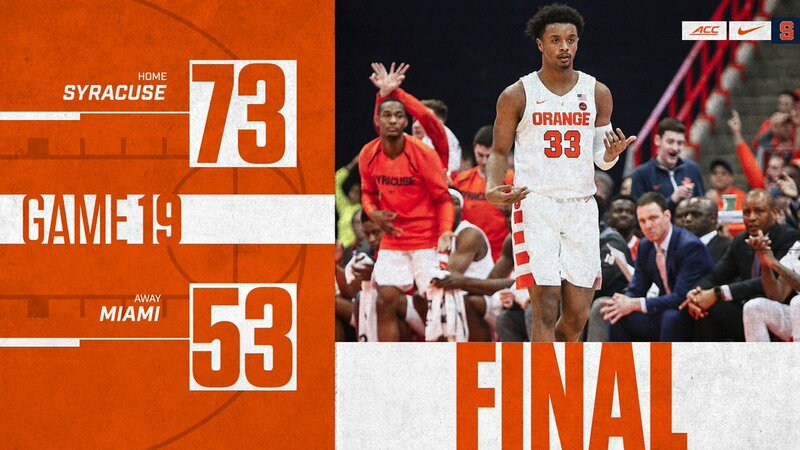 A season-high 14 three-pointers, including six from Elijah Hughes, led Syracuse (14-5, 5-1 ACC) to a 73-50 defeat of Miami (9-9, 1-5 ACC) Thursday night at the Carrier Dome. The Orange finished the night just one shy of a school record 15 three-pointers that came on March 4, 2017 against Georgia Tech. Hughes’ six three-pointers helped him tie a career-high 22 points on a hot-shooting hand that saw a 6-of-9 performance from behind the arc and went 8-of-13 from the floor. The redshirt junior had an all-around complete game, also contributing three rebounds, three assists, three steals and three blocks. Buddy Boeheim reached double-digits for the second consecutive game, adding 12 points on a night where he shot 3-of-6 from three-point range. In his 80th consecutive start, Tyus Battle narrowly missed his first career double-double with 10 points and a career-high nine assists. The Orange were helped by a balanced scoring offense that saw eight players score at least two points.